My aim of walking the South Downs Way in 2017 has got off to a slow start, but the first week of March coincided with my husband having a week off work and so I booked the Wednesday off for us to go out walking together. Typically, the weather forecast was terrible, but determination won and we headed out with spare clothes in the car to change into if needed. In the end it was the fog, not the rain, that was the enemy and so we headed for a walk I knew well. The last thing I wanted to do with a 3pm school collection pencilled in was to try a new route and end up walking rings around Cissbury Ring trying to work out how to get back to the car. 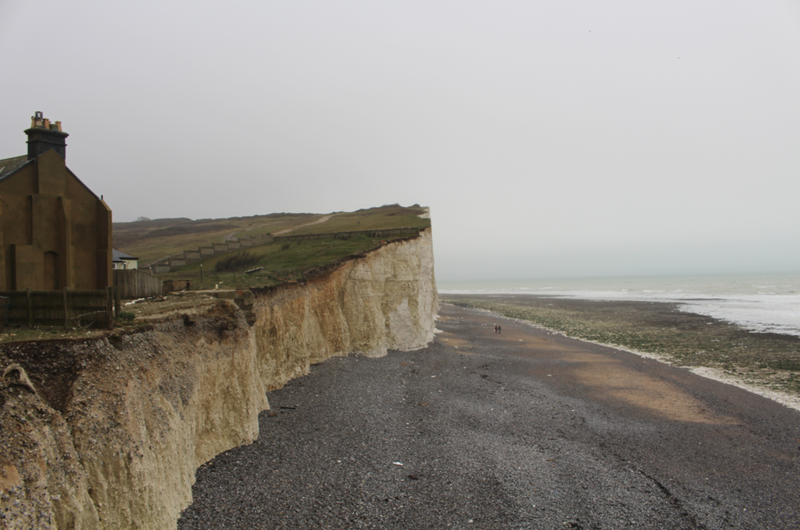 So we headed over to Birling Gap. As we parked we spotted one group of seasoned walkers (practical clothing, waterproof rucksacks, maps etc) heading up the hill so it was good to know we weren't the only ones that had a plan and were sticking to it. At first the visibility wasn't too bad, but we were still very cautious and made sure we headed on the path inland and kept the dog on a lead. However, as we walked up the hill the fog got worse, and we could hear the sea in the distance but not see it. 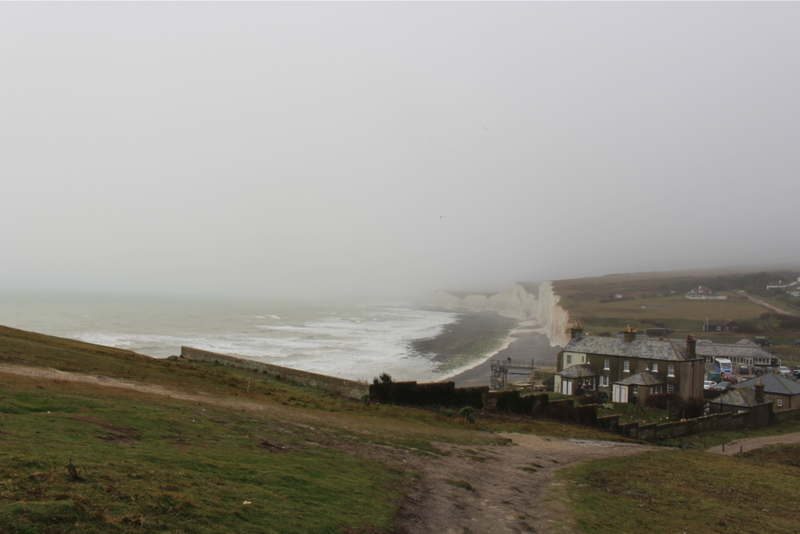 It was eerily quiet, and as we decided to head back we saw the shape of the Belle Tout lighthouse in the distance and so walked up to that, turned around and walked back. So in terms of distance the first walk was a little disappointing, but it was interesting to experience the area in inclement weather. I have visited many times, but always in summer with the sun shining and so it was good to see it in a different way. It reminded me of the first time I went to Haworth. As we headed up the moors towards the village it started snowing, and by the time we reached Haworth many of the roads were impassable. It gave us a good idea of how remote it was when the Bronte's were writing, and a contrast to later visits in the height of summer. The beach is next to the carpark and it looked dramatic, but far from inviting, so we headed inside for lunch. I noted in my journal how much the place had changed. I remember the old cafe being further back from the coastline, more houses, it is scary how quickly the erosion seems to be happening. I am not too disappointed at the short walk as it is somewhere to return to another few times throughout 2017, and hopefully stretch the legs a little further next time! It is stunning part of Sussex and I am excited at the thought of stitching some work from these photos.